Maintained by east Tennessee artist, Sarah Pollock, this web log features her recent paintings and contemporary topics related to her artwork. Visit www.sarahpollock.com to see more original landscapes and cityscapes. 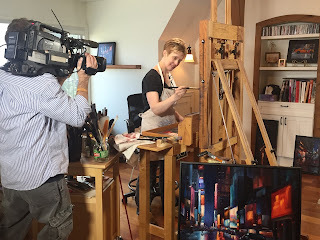 This past week, East Tennessee PBS reached out to me and came to my studio to interview me about my artwork for their program, "Tennessee Life." What a fun day! 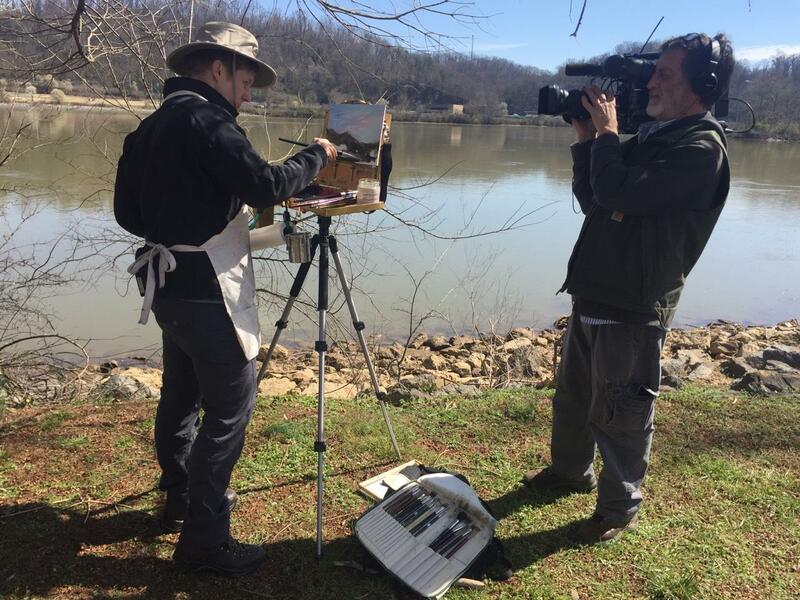 It's always gratifying when others take an interest in what we do, and I appreciated the opportunity to share more with them about my artwork as part of a larger program they're producing to feature east Tennessee landscapes and cityscapes. The program producer, Stephanie Aldrich, and her camera man, Brudd, hauled all of their lights, cameras, and production equipment up to my studio in the second floor of our home and set up for a wide-ranging interview about my background, current work including my painting series of "Thirty from Tennessee," and how I landed in Knoxville last summer. 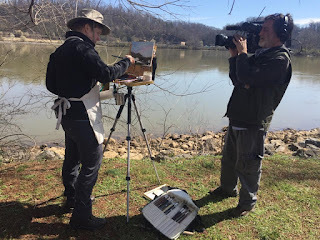 We even ventured outdoors for a brief stop along the Tennessee River to see how I set up for my plein air field work. Luckily, we finally had a day without rain (!). The interview segment will air during the third weekend in April, and I'm looking forward to seeing how it all comes together. I'll post a link to their YouTube channel when it's available. I'm grateful for this opportunity and I hope it will be the first of many steps in introducing my artwork to Tennessee as my husband and I continue to settle into Knoxville following our relocation from Pennsylvania last summer. This past weekend I took my first class at the Great Smoky Mountains Institute at Tremont, a non-profit research and teaching organization located within the national park. 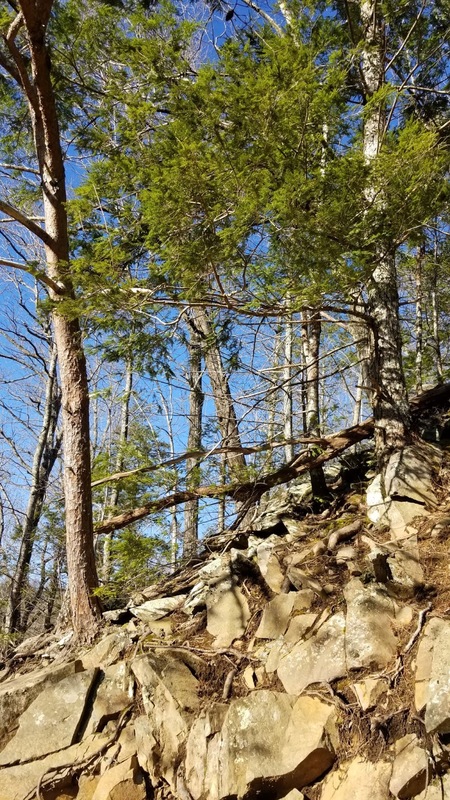 I'm determined to make friends with my new surroundings in eastern Tennessee, and as part of this process I've decided to pursue training at the institute to become a certified Southern Appalachian Naturalist. I kicked things off in this pursuit with an initial offering in Naturalist Skills. It was fun! The core emphasis of the class was the importance of slowing down and taking time to notice and document your observations. As an artist, I'd like to think that I already do this by default. But I learned that I still have more discipline to cultivate in this regard. And along the way I learned some interesting things such as the presence of different micro climates within tenths of a mile along a hiking trail, resulting in very distinct flora and fauna. All of these years that I've been hiking into the woods and painting en plein air and I never appreciated this nuance before. Later this year I'll take additional classes about mammals and aquatic natural history. I'm so stoked! As someone who's currently pretty ignorant about woodland ecology, I believe that taking these classes will give me greater insight into my new environment and inform my landscape paintings. I'm excited about the year ahead and I look forward to sharing more with you about the interesting tidbits I learn. After a tumultuous transition from Pennsylvania to a new home in Tennessee in 2018, I'm looking forward to a quieter year ahead with better opportunities for creation and calmness. Huzzah! To start 2019, I'm going to focus on a brand new series of works. 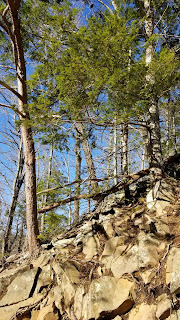 Since landing in Knoxville, I've tried some new foods (and discovered that I love sorghum butter and biscuits) and I've seen a lot of new things, including southern cities that I hadn't previously visited as well as stunning Tennessee state parks. Visiting all of these places helps me learn more about the history and culture of my new home. And all of these new visual stimuli have already had an influence on my artwork. For example, I now have access to the Great Smoky Mountains National Park within an hour's drive of my home. 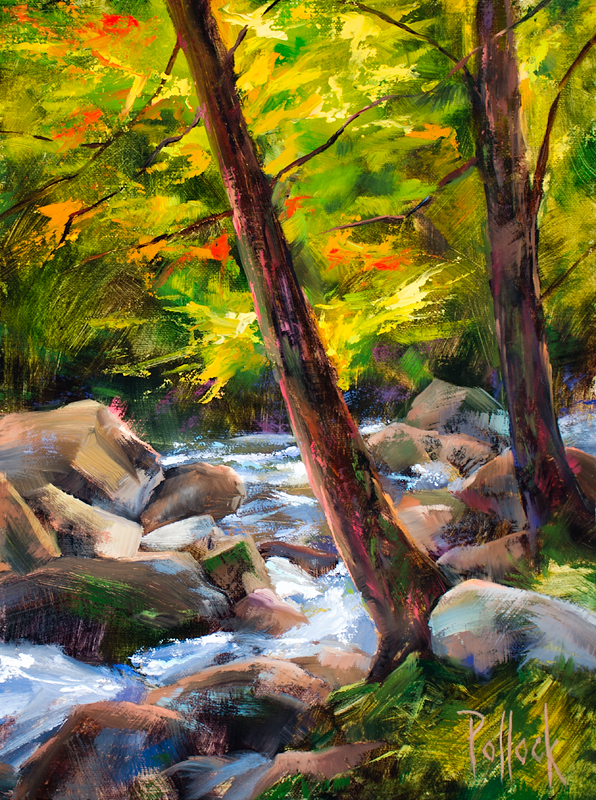 I've really enjoyed going out there to work en plein air because I'm learning a ton about light effects and capturing roaring streams. "30 from Tennessee" will be a series of paintings inspired by my new surroundings in eastern Tennessee. These small format works and studies will highlight my early impressions of my new home. I'll roll out a new painting once every week or two and the subjects will vary between my favorite themes of landscapes and cityscapes. The first piece I'm featuring in this series is "Great Smoky Mountains No. 1 - Early Fall." This painting was created en plein air along the Middle Prong of the Little River in the park, just south of Townsend, Tennessee. If you've followed my landscape work over the years, then you know that I enjoy working in a series format for my plein air landscape subjects, especially when I find a place that I really enjoy, such as the gorgeous Black Moshannon State Park near my old home in central Pennsylvania, which inspired a series of forty-six works spanning over a decade. "Early Fall" is the first in what I anticipate will be a long-running series of works from the Great Smoky Mountains National Park, and I'm pleased with the quality of light within this work. In addition to the milder climate here in the south, the light is a littler warmer, too. It's different from what I'm accustomed to north of the Mason Dixon Line, and I'm enjoying this new quality. Stay tuned for new additions to the "30 from Tennessee" series in 2019. As my work schedule permits, I'll unveil a new piece every week or two on my Instagram account. You can also visit my web site to see the full series in progress. Check out the About Me information on my portfolio web site. All materials on this web site are copyright 2016 by Sarah Pollock. Simple theme. Powered by Blogger.